WARNING - Removing radiator cap • Never attempt to remove the radiator cap while the engine is operating or hot. Doing so might lead to cooling system and engine damage and could result in serious personal injury from escaping hot coolant or steam. • Turn the engine off and wait until it cools down. Use extreme care when removing the radiator cap. Wrap a thick towel around it, and turn it counterclockwise slowly to the first stop. Step back while the pressure is released from the cooling system. When you are sure all the pressure has been released, press down on the cap, using a thick towel, and continue turning counterclockwise to remove it. • Even if the engine is not operating, do not remove the radiator cap or the drain plug while the engine and radiator are hot. Hot coolant and steam may still blow out under pressure, causing serious injury. The coolant level should be filled between F and L marks on the side of the coolant reservoir when the engine is cool. 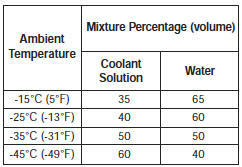 If the coolant level is low, add enough specified coolant to provide protection against freezing and corrosion. Bring the level to F, but do not overfill. If frequent additions are required, see an Authorized Kia Dealer for a cooling system inspection. Recommended engine coolant • Use only soft (de-mineralized) water in the coolant mixture. • The engine in your vehicle has aluminum engine parts and must be protected by an ethylene-glycolbased coolant to prevent corrosion and freezing. • DO NOT USE alcohol or methanol coolant or mix them with the specified coolant. • Do not use a solution that contains more than 60% antifreeze or less than 35% antifreeze, which would reduce the effectiveness of the solution. For mixture percentage, refer to the following table. WARNING - Radiator cap Do not remove the radiator cap when the engine and radiator are hot. Scalding hot coolant and steam may blow out under pressure causing serious injury. Changing the coolant Have coolant changed by an authorized KIA dealer according to the Maintenance Schedule at the beginning of this section. CAUTION Put a thick cloth or fabric around the radiator cap before refilling the coolant in order to prevent the coolant from overflowing into engine parts such as generator. WARNING - Coolant • Do not use radiator coolant or antifreeze in the washer fluid reservoir. • Radiator coolant can severely obscure visibility when sprayed on the windshield and may cause loss of vehicle control or damage to paint and body trim.